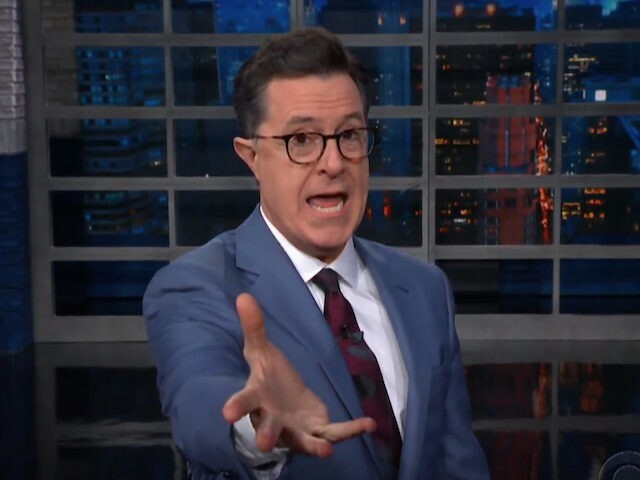 Late-night talk show host Stephen Colbert pushed the conspiracy that First Lady Melania Trump has gone missing during his show on Monday, the same day she was seen sitting next to her husband President Donald Trump during a solemn White House ceremony in which Gold Star Families were honored. Mrs. Trump recently underwent a kidney operation to treat a benign condition and has since been absent from public life. However, she was reported to have attended ceremony on Monday event for Gold Star families that was closed to the press. The late-night funnyman’s quips, however, came on the same day that Mrs. Trump was seen sitting next to her husband President Donald Trump during a solemn White House ceremony in which Gold Star Families were honored. A short video showing the Trump’s walking into the ceremony circulated online. Last week, Mrs. Trump attempted to quash rumors of her activity by claiming she was still recovering at home in the White House, while also attacking the media for “working overtime” with their speculation. Indeed, the rumors around Mrs. Trump staying under the radar have mushroomed into outright hysteria. Atlantic Senior Editor David Frum hypothesized that Mrs. Trump had been beaten by the President. Rolling Stone senior writer Jamil Smith insisted Mrs. Trump’s absence was “about concealing abuse.” CNN media watchdog Brian Stelter told his Reliable Sources audience that Mrs. Trump had been “invisible,” while failing to mention that CNBC’s Eamon Javers had confirmed days earlier that Mrs. Trump was seen walking around in the White House. Mrs. Trump has previously been the target of mockery on Colbert’s show. In 2016, actress Laura Benanti impersonated an interview she gave to CNN’s Anderson Cooper where she discussed the “locker-room talk” used by her husband.